13 October 2017 - "a heavy dose of nostalgia"
8 June 2017 - "a storming success"
Strictly Come Dancing judge, theatre director and choreographer Meera Syal returns to the role of the horrible Miss Hannigan for a limited 10-week season, following huge success with the UK tour. 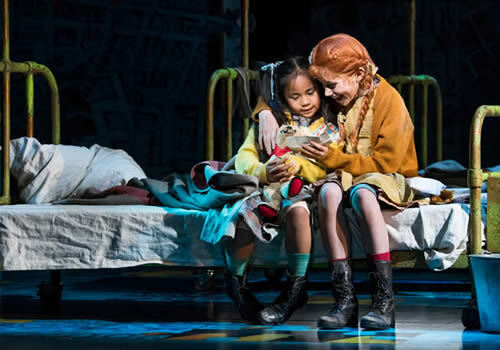 Nikolai Foster's hit version of popular Broadway musical Annie plays at the West End's Piccadilly Theatre until February 2018. 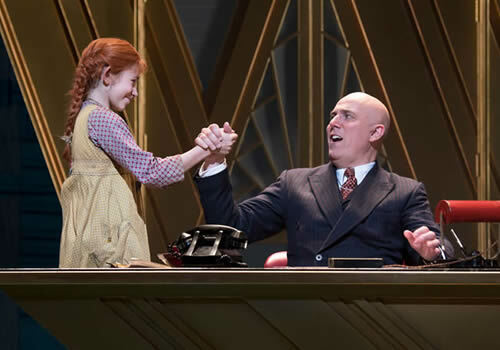 Based on the comic strip Little Orphan Annie, the smash-hit musical takes place in 1930’s New York and follows the story of Annie, who lives with a group of charming orphans in Miss Hannigan’s tormenting orphanage. Ordered about each day, Annie is determined to one day find her real family. When she’s plucked from the orphanage to spend Christmas with famous billionaire, Oliver Warbucks, Annie’s life begins to change. 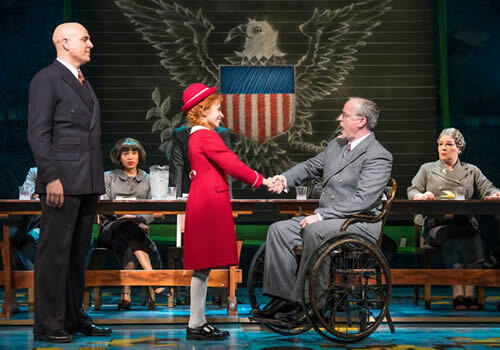 Featuring a well-known score with music and lyrics by Charles Strouse and Martin Charnin, Annie includes songs such as “Maybe”, “It’s a Hard Knock Life”, “Tomorrow” and “I Don’t Need Anything But You”. Last seen in the West End in 1998 at the Victoria Palace Theatre, this famed musical comes into London for the first time in nineteen years! Meera Syal stars as Miss Hannigan, opposite Alex Bourne (Mamma Mia!) as Oliver Warbucks and Holly Dale Spencer (Sweet Charity) as Grace. Best known for her hilarious stand-up and sitcom Miranda, Hart is a BAFTA-winning actress (Call the Midwife), with stage credits including Cruising at the Bush Theatre and All About Me at the Soho Theatre. Further casting includes Jonny Fines as Rooster and Djalenga Scott as Lily. Annie is be played by three actors; Madeleine Haynes, Lola Moxom and Ruby Stokes. Ensemble members include Keisha Atwell, Sophie Ayers, Bobby Delaney, Nic Gibney, Patrick Harper, Ben Harrold, George Ioannides, Megan Louch, Benjamin Mundy, Ben Oliver, Heather Scott-Martin, Anne Smith, Kate Somerset How, Katie Warsop and Russell Wilcox. 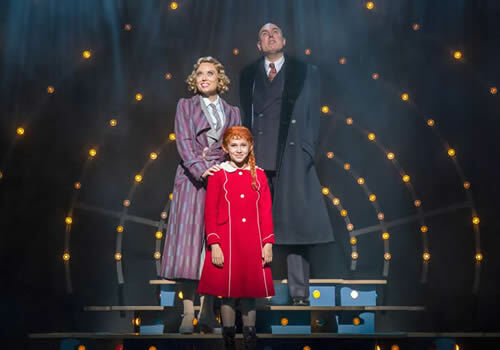 Directed by Nikolai Foster, Artistic Director of the Leicester Curve, Annie features design by Colin Richmond, choreography by Nick Winston, lighting design by Ben Cracknell and sound design by Richard Brooker. Officially opening at the Piccadilly Theatre London on June 5th 2017, the musical began previews in May and is booking until February 18th 2018. 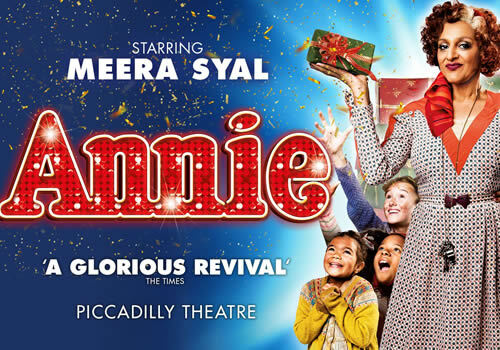 Annie is suitable for children and families of all ages!